At the risk of spoiling this review in the first ten words, I’m driven to make clear very early just how completely devoid of fun and entertainment I found this title to be. It was a truly dreadful experience to have to play it and I feel confident saying I would never recommend it to anyone for any reason. In fairness, however, I am apparently alone is this assessment. 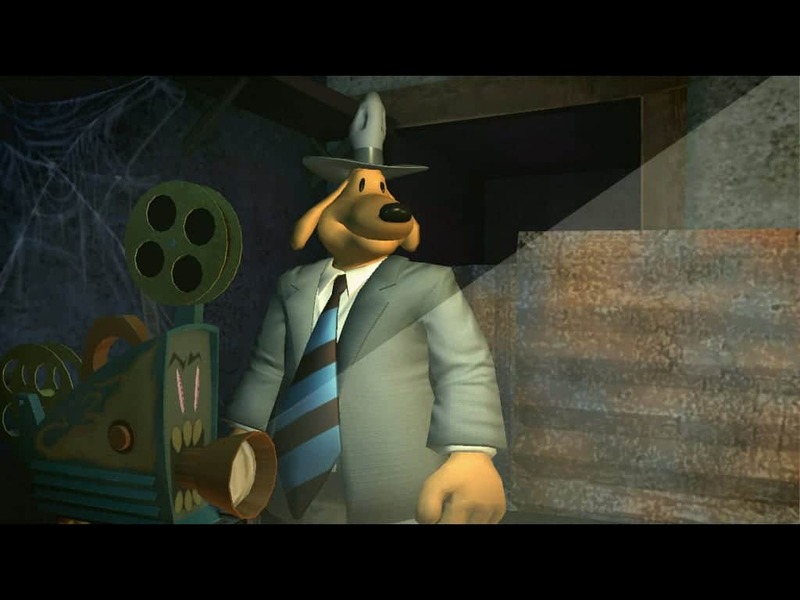 Sam and Max are a 50’s-style cartoon detective duo (animals — mind you: a chubby, insecure dog and a twisted bunny) that have gained most of their popularity through the consistent release of games they are featured in (this is the third season), rather than through traditional comic book success. Previous entries in this series have reviewed reasonably well. 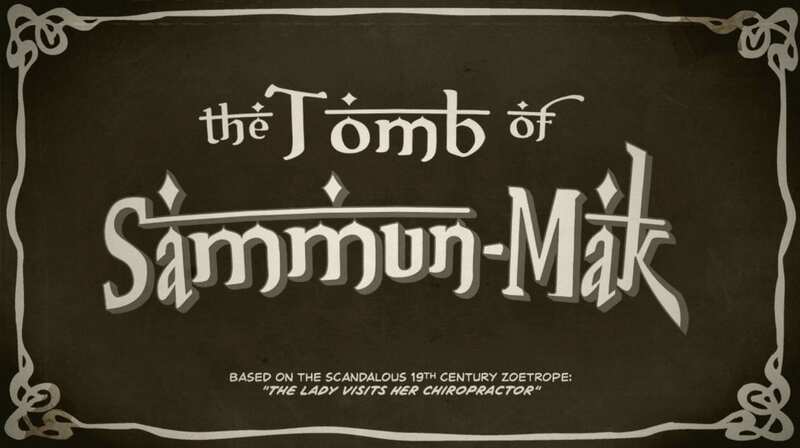 The Tomb of Sammun-Mak is a digital offering for PC, PS3, Mac and iPad from Telltale Games that is the second in a series of five point-and-click adventures under the umbrella title, â€˜The Devil’s Playhouse.’ I reviewed Episode 1, â€˜The Penal Zone,’ a few weeks ago and had little great to say about it, but tried to give it some benefit of the doubt since it was an introductory episode and my first experience with the franchise. It did have a terrific villain and some genuinely funny moments that led me to believe there may be value in the remainder of the series if I gave it a chance. Unfortunately, these hopes were dashed by my two playthroughs of Episode 2. In response to past criticisms that the series was becoming too linear and predictable, Telltale decided to employ a confused chronology scheme that, on the surface, seems like an inventive and fun idea. Max uses his latent psychic abilities to take control of a projector that plays four film reels of the duo’s ancestors from the turn of the century. These powers allow he and Sam to warp into the films, inhabit their ancestor’s bodies, and control the events that lead up to the initial discovery of â€˜The Devil’s Toybox’ – the only consistent plot point between the first two games. The Devil’s Toybox is a chest full of wild gadgets that Max’s yet unexplained psychic abilities allow him to manipulate in order to overcome the various obstacles presented in the game. While a good idea in theory, the execution here is just a frustrating mess. On several occasions, it’s difficult to tell whether you’re missing a clue within a given scenario or need to retrieve it from one of the other selectable segments of the adventure. This would be no big deal if there weren’t significant load times involved in switching between the various parts of the story. If you’re having any trouble whatsoever figuring out a particular problem, you are likely to go back and forth between episodes at least a few times, enduring more and more load times and, even worse, the same stupid jokes over and over again. It all goes a long way toward undermining the entire point of the game, which is to be funny. Blast Factor: While I could speak on some of the technical issues that hampered my experience here, the major problem I have with â€˜The Tomb of Sammun-Mak’ is the same one I had with â€˜The Penal Zone’- these games are just not funny. And they are supposed to be. If you have a comedy "game" that incorporates no tangible "gameplay elements" and subsequently falls flat on the comedy side of things, then you really don’t have much. This is not to say that the writing is not often smart and the voice acting is not good, just that the end product does not deliver the credible, comedic experience that it should. Adding to this, the disjointed time-line of Episode 2 only amplifies the lack of real humor with mind-numbing dialogue repetition. The worst thing about â€˜The Devil’s Playhouse,’ however, is that these various episodes are not currently available individually. If you want to play any of them, you are forced to plop down the full-season price of $34.95 and just pray that, even if you happen to like the first two, the remaining three will continue to hold your attention. It’s not a risk I would recommend taking. Note: This review was done on the PC version and a copy was provided by the publisher.